Since the 1940s, presidential election results are very highly correlated with a few key “fundamental” variables that including domestic economic growth during the election year and the incumbent president’s job approval rating. Indeed, separate research on the effect of candidate characteristics, negative campaign ads, debate gaffes, etc. tend to show that they have only a negligible correlation with the outcome. In the end, most everyone votes for their party’s candidate in presidential elections, regardless of whom their party happened to nominate, and a good economy and a popular incumbent president tend to favor the incumbent president’s party. Indeed, in the fall of 2016 political scientists published 11 different outcome forecasts. Based on these few “fundamental” variables, they predicted that Hillary Clinton would win anywhere from 47.5% to 52.7% of the two-party popular vote, with an average of 50.8%. In the end, Hillary Clinton won 51.1% of the two-party vote. From this perspective, everything that happened in the campaign from Hillary Clinton’s emails to Donald Trump’s Access Hollywood tape to Clinton’s lead in campaign spending and advertising to Russia’s attempts to sow discord in America’s election outcome, likely amounted to moving the needle roughly one third of one percentage point of the popular vote beyond what the fundamentals would have predicted. Donald Trump’s election victory was due much more to a lucky (but statistically improbable) Electoral College bounce than to Russian hacking. Enter preeminent political scientist Dr. Kathleen Hall Jamieson, author of more than a dozen scholarly books and one of the nation’s foremost experts on the intersection of politics, the media, and communication. 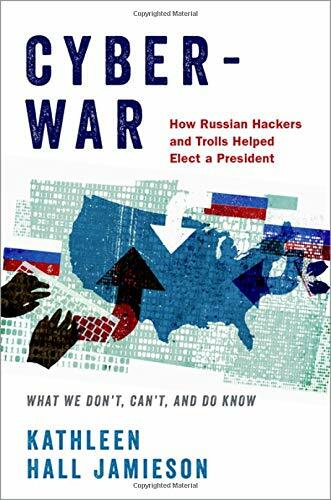 In her new book Cyberwar: How Russian Hackers and Trolls Helped Elect a President, Jamieson examines the question of whether Russian intervention in the election was enough to push Donald Trump over the Electoral College finish line. Jamieson argues that in order to conclude that Russian hacking swung the election outcome in Trump’s favor, the “efforts would have needed to be 1) extensive enough to make a difference . . . , 2) consistent with Trump’s messages and interests, 3) focused on constituencies whose mobilizations or demobilization was critical to a Trump victory, 4) persuasive, 5) well targeted, and 6) able to shape press coverage and debate focus and affect the news environment during the period in which late deciders were determining whether to vote and, if so, for whom. Separate chapters are then dedicated to methodically and rigorously examining how much support there is for each of these six conditions. Most of the book consists of documenting the evidence about the nature of social media content generated by Russian trolls, how extensive it was, and quantitatively analyzing how persuasive it might have been to key audiences. These analyses are based on hypotheses derived from political science research on communication, persuasion, and campaign effects (outlined in Chapter 2). Jamieson is careful to explain that most voters are largely impervious to media effects, but that in a close election, outcomes can be tipped even if only a few voters are persuadable. In the end, Jamieson argues that there is enough evidence to infer, although not definitely prove, that Russia’s efforts were probably sufficient to persuade 78,000 people in Pennsylvania, Wisconsin, and Michigan to vote for Trump who otherwise would have either voted for Clinton or not voted at all, allowing Trump to win a plurality in each of these three states and with them, the Electoral College and the U.S. presidency. In an election where the popular vote loser won the Electoral College because of 0.5% of voters in three close states, one could just as legitimately say that Hillary Clinton lost because she contracted pneumonia on the campaign trail, which raised doubts about her physical health or that Donald Trump won because his last-minute campaign visits to Michigan and Pennsylvania. There remains no solid evidence that the effects of Russian hacking and trolls were any larger than any of these other minor campaign events which are largely absent from the dominant narratives of the election outcome. A more troubling question, however, is what Jamieson’s research implies about the choices of the American electorate. Many predicted that Donald Trump would (and should) easily lose because the American people would never ultimately choose as the chief representative of their political values and priorities someone who bragged about committing sexual assault on tape, who openly mocked disabled people and the physical appearance of his female rivals, who called for a religious ban on Muslims entering the United States, who referred to women as “dogs” and mocked them for their menstrual cycles, who invited an advocate of the alt-right racial ideology to serve as his campaign manager and Chief Strategist, who undermined respect for basic democratic practices by openly vowing to accept the outcome of the election only if it was in his favor, who regularly heaped praise on authoritarian dictators around the world. If social media memes by Russian trolls were ultimately as persuasive (if not more persuasive) to a critical mass of the American public than each of these other clear signals for Trump’s unfitness for office, then we truly have the government we deserve.